Here we are at the Egg Files II. Oh how time has flown. The First Egg Files was way back when. Taking pictures was not exactly my strong suit 🙂 But hey, we learn and grow, right? 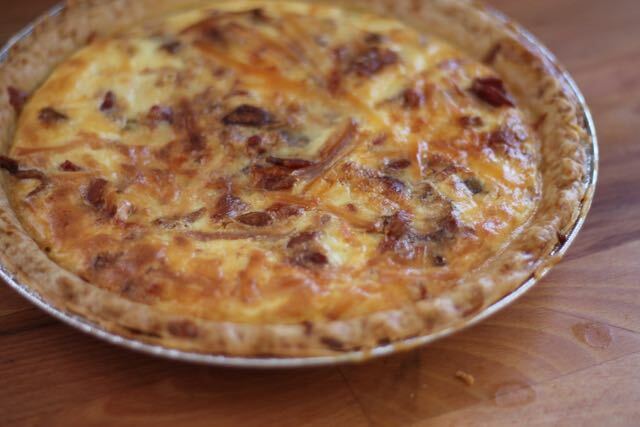 On the menu today will be an out of this world Quiche (a.k.a. 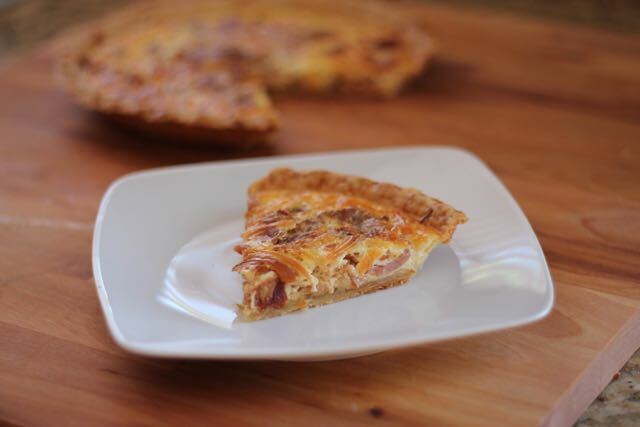 Refrigerator Pie) and Flan. This was my first time ever making flan and it was a success! I am no longer intimidated by the incredible edible egg. Let’s dig in to the recipes. 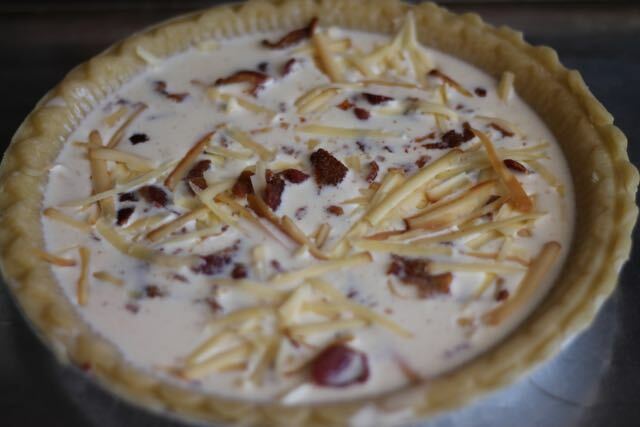 For the Refrigerator Pie, there are many different variations you can do. 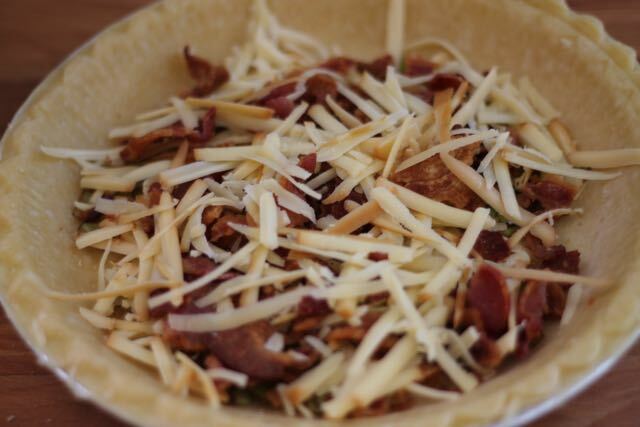 I chose bacon, leek and Gruyere. I actually used 2 types of Gruyere, regular and smoked. In addition to that, we have half and half and two eggs. Yes, only two eggs. I was shocked too! 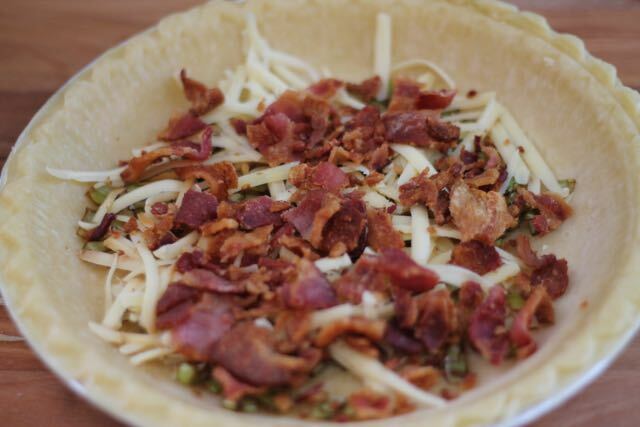 Start off with baking the bacon. I had some leftover truffle butter from my Truffle Mac and Cheese Bun Burgers so I had to use it up. It would be a crime not to! Whisk together eggs, half and half, salt and nutmeg. Slowly and carefully pour in the egg mixture. Make sure to leave some room on top for expansion. Devour! This was sooooo good and so easy to make. 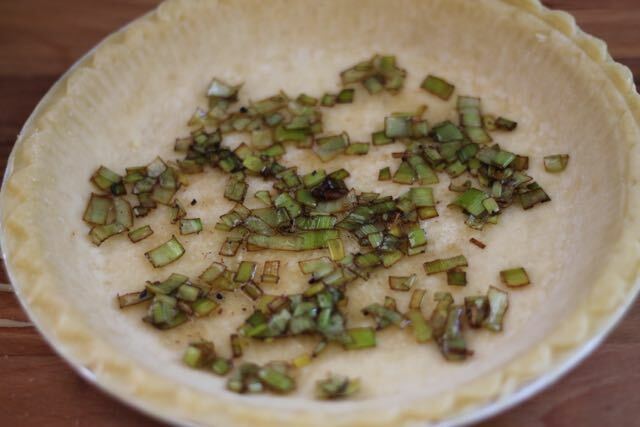 My forever go to Refrigerator Pie. Amen! 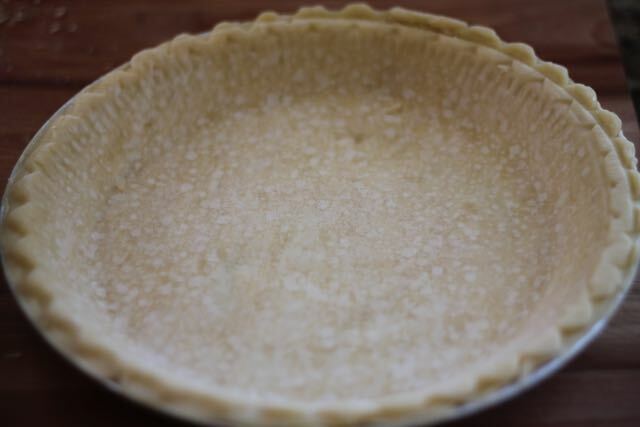 Refrigerator Pie Rules: Heat oven to 350 degrees F. Evenly distribute the pie fillings in the pie crust. 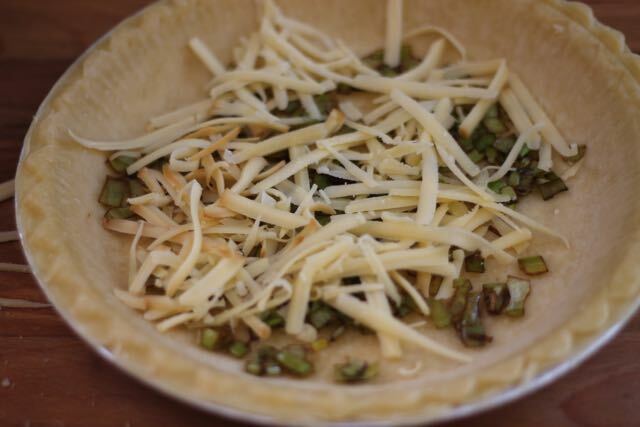 Do not overfill the crust with the filling ingredients. Do not pour too much royale into the crust. 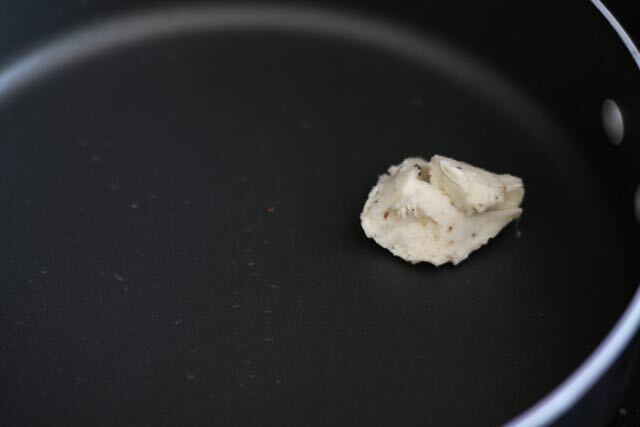 The eggs will expand upon cooking. Bake the pie until it is firm to the touch like set Jell-O, about 45 minutes. Cool the pie for at least 15 minutes before slicing. Put a tablespoon of your desired topping. I rolled with caramel for them all. This recipe would be quite nice. I ended up using the jarred stuff in a pinch. Whip 3 whole eggs and 3 egg yolks in a bowl until they thicken and lighten in color. Get your arm muscles ready! 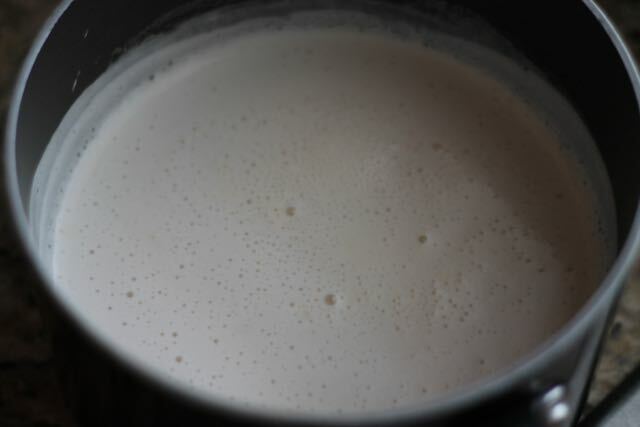 Combine milk, half and half, vanilla and sugar in a saucepan and bring to a simmer. SLOWLY temper the egg mixture into the milk mixture. 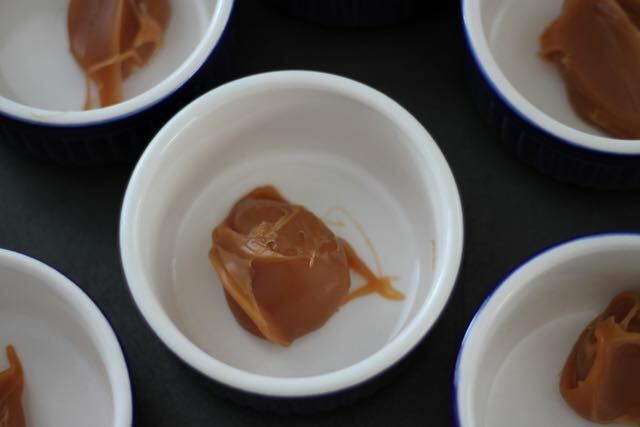 Strain, then pour into ramekins. 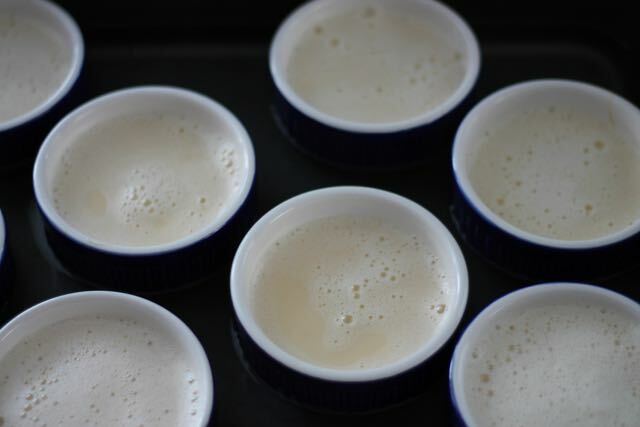 Pour boiling water into the pan and around the ramekins so it comes right under the custard level. Bake for 40 minutes. Cover and chill or immediately flip over and eat like I did 🙂 This was so creamy and delicious. It turned out perfectly. I’ll definitely be making these again. In the saucepan, combine the milk, half-and-half, vanilla, and sugar. 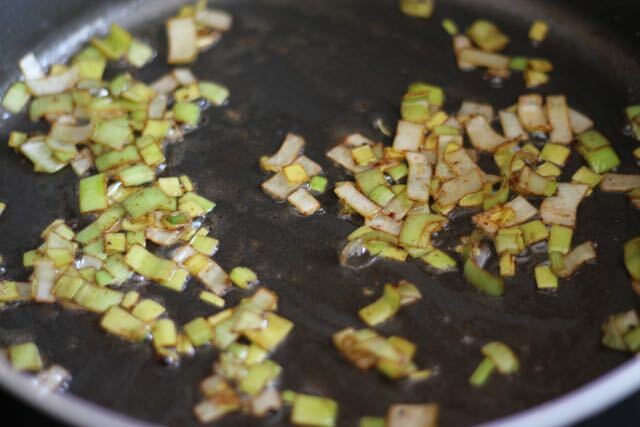 Bring to a bare simmer over medium-low heat. Next, place 1 to 2 tablespoons of each topping into each of the custard cups. The topping should come a few millimeters up the side of the custard cup. 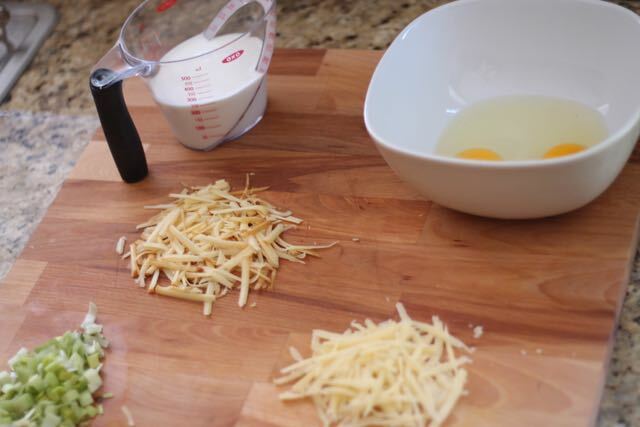 Place a mixing bowl on a rubber pad or a wet towel to prevent the bowl from spinning out of control. In a mixing bowl, combine the remaining whole eggs and the yolks. 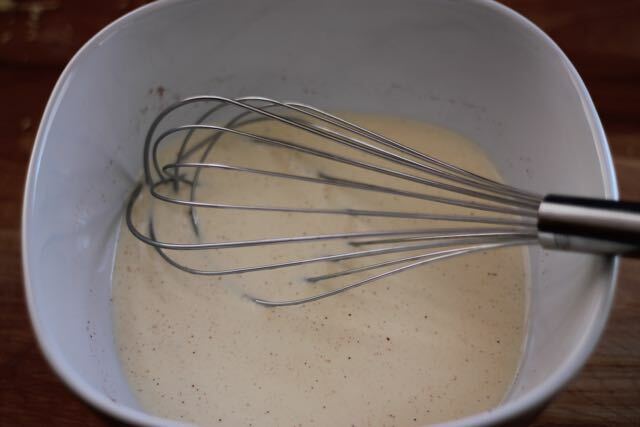 Whip the eggs with a whisk until slightly thickened and lightened in color. 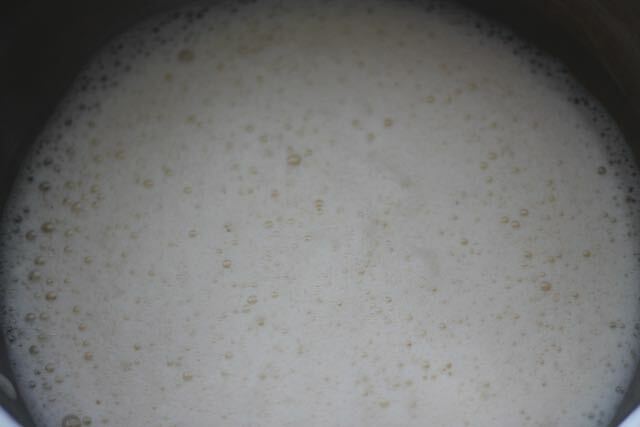 While whisking the eggs, drizzle in about a quarter of the hot milk. 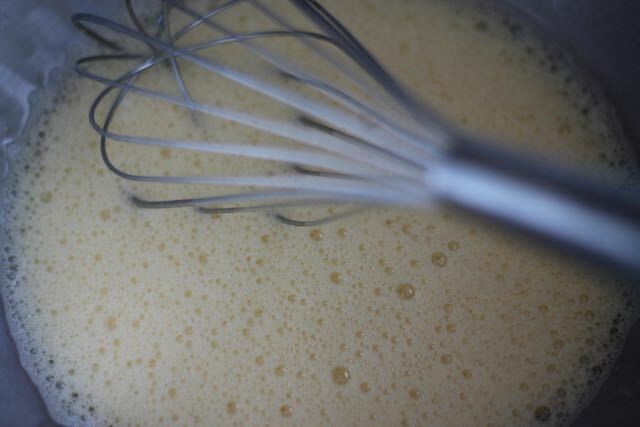 Now whisk the tempered eggs back into the saucepan with the remaining milk mixture. Place a fine mesh strainer over a glass or stainless steel bowl with a spout. Pour the egg mixture through the strainer in order to catch any curdled egg bits or particles that may be in the mixture. 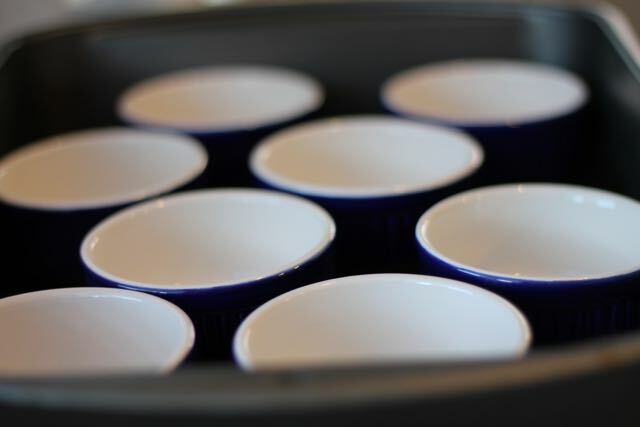 Place the custard cups into the roasting pan. Evenly distribute the custard into the custard cups, going short on the first pass. Place the pan on the middle rack of the oven and pour boiling water into the pan just under the level of the custard. Cook the flans for about 40 minutes, or until they wobble slightly when the pan is wiggled, about 40 minutes. 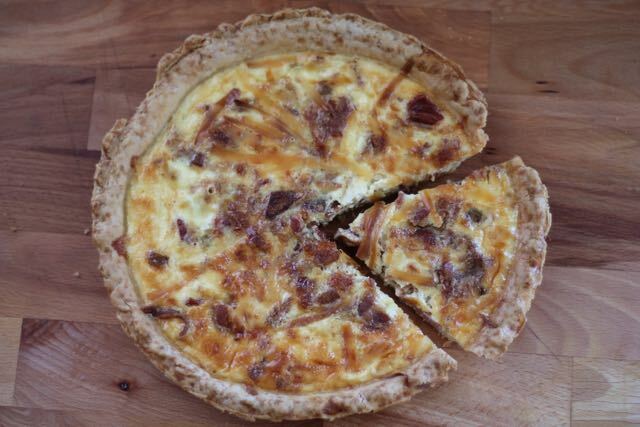 You can also insert a paring knife midway between the edge and the center. If it comes out clean, the flans are done. Using tongs, remove the cups from the pan to a towel-lined sheet pan. Allow the water in the roasting pan to cool before discarding. Cool, cover and chill.